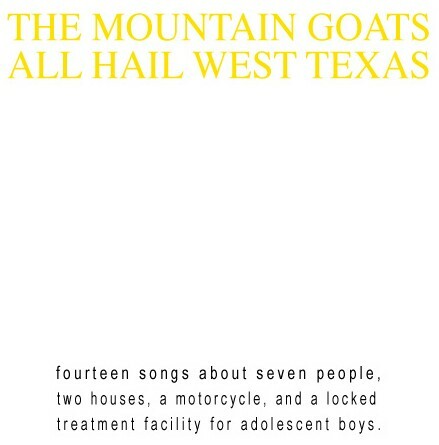 On July 23 in the United States, and Aug. 6 in Europe, Merge Records will reissue the Mountain Goats’ beloved 2002 album, All Hail West Texas. The last of John Darnielle’s home-recorded albums, All Hail West Texas was recorded via cassette by Darnielle himself, transferred to 1/4-inch reels and then released on Emperor Jones Records. With the Merge reissue, the original album will be re-released with seven additional, previously unreleased tracks, on CD and, for the first time, LP. The reissued album will also feature an 1,800-word essay written by Darnielle, himself. Read a post about the recordings via the Mountain Goats’ Tumblr.